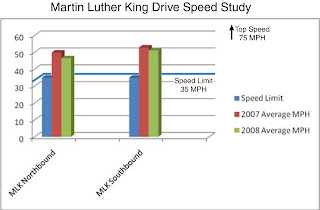 This chart compares the 2007 and 2008 studies. Last night, I was riding on the MLK Drive path when I came across the accident scene in the attached photos. One of the cars (the blue Honda Passport) took out a light pole, drove onto the recreation path and then took out two more trees before coming to a halt. I got to the scene about a minute after the accident and met BCGP Member John Holmes. John was forced to make a controlled crash and received a few scrapes, but he was able to avoid the worst. Some of the drivers were in shock, but no one else was hurt as far as I could tell. 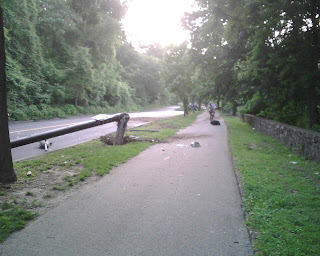 Light pole damage on MLK Drive, the pile of debris in the background is where the vehicle came to rest after veering on to the bike path.